J.R.R. 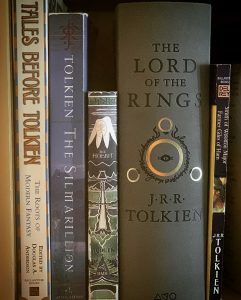 Tolkien Books by Felicia V. Edens All we have to decide is what to do with the time that is given to us. When I saw the trailer for a biopic about J.R.R. Tolkien to premiere on May 10, I nearly squealed with excitement. J.R.R. Tolkien is one of the most legendary writers of the 20th century. By newly inundating our culture with elements of fantasy, hobbits, gollums, elves, trolls, orcs and more have become part of our contemporary mythology. Before you watch Tolkien's own early life story on screen, you might want to celebrate him with these materials. Read about the lovable hobbit Bilbo Baggins, meet the wise wizard Gandalf and then watch the film trilogy. Read the three-part LOTR epic to find out what happens to the *precious* ring. Follow it up with watching the films that portray beautiful visual representations of Middle Earth. Does anyone else feel the urge to start a Tolkien marathon? Whether you engage with his work by sprinting or going long distance, this voyage is not one to miss.